Fortunately the shoulder has recovered enough for me to join the 2014 In-Training for Peachtree group, which met for its first week this morning at Town Brookhaven shopping center. We have a group of about 70 runners, and 10 - 11 volunteer coaches, to accommodate a range of abilities. The lead coaches are a couple of age groups ahead of me, but I looked up their times in a few recent races, and they have both finished 10K races in less than 50 minutes (my best time for 10K is 55:30). Under those circumstances, I was surprised to find that I qualified for the "rocket subgroup"! The coach in charge of this subgroup, Rob, set a pace of approximately 9:30 minutes per mile, which was a good workout for me but not pushing too much. Three of us kept pace with Rob for a 25 minute run on Peachtree Road, initially heading for Buckhead, and after 13 minutes turning back at Club Drive. We were a little too slow for one fellow in the rocket subgroup, but his pace is something for me to work up to. And I was definitely the oldest person in the rocket subgroup, so I felt good about keeping up with them. Peachtree Road in this section is relatively flat, so it was a good initial run for the group, to get a sense of each participant's starting level. But the sidewalk was not great, so I was really careful. We had to stop at a couple of traffic lights, but I was pleased with the average pace of 5:49 min / km (9:21 min / mi) according to RunHelper. The best news is that I didn't feel any pain in the shoulder during or after the run. I hope that some of the runs in the coming weeks will be through the Brookhaven residential streets, which I think will be a nice place to run, although probably more hilly. 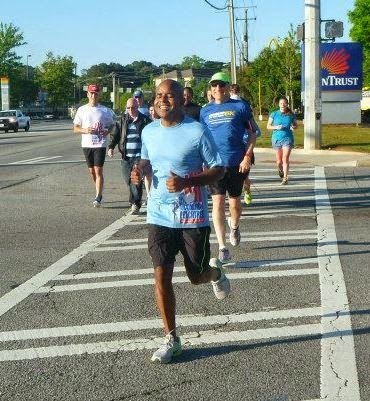 As the In-Training groups meet on Saturday mornings, I probably won't run any organized races until the Peachtree on July 4, so I will post brief accounts on the weekly training sessions. The sessions are listed in a "countdown" from week 11, with the Peachtree Road Race in week 1.